Swimming pools, barbecues, and sunbathing.... oh, wait that last part is maybe a little outdated. Try 1989 outdated. What I won't do for my readers.... The lovely photo you are gazing upon is me at age 12, enjoying my new, trendy 2 piece suit and a book - likely a fantasy novel from the used book store down the hill. 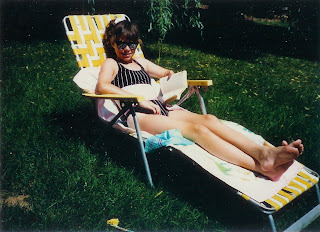 The scrunchy, the sunglasses, the stripes, the sunbathing.... so eighties! I have seriously pale skin. I really don't tan but at the time of this photo I was still discovering that fact. All the pre-teens in my school were going to tanning salons by the ripe old age of 11 . My family being the budget type I had to use the free tanning salon - the sun. I spent hours laying out, feeling hot and sweaty. My prize? Some very faint swimsuit lines and some likely skin damage. Fortunately it didn't take too long before I decided that laying out was real pain and not very productive for me. I resigned myself to the fact that I am just pale. Fortunately for me I was way ahead of the real trend - skipping the suntan. As we embark upon the coming holiday week I just wanted to take a moment to offer a few suggestions that are totally 2008. 1. Sun exposure is dangerous. Not only can you end up with a really uncomfortable burn but that burn could someday give you cancer. Sunscreen should be your very first thought if you are going to be spending any more than 15 minutes in the sun. When really desperate even I would choose a Franken-chemical sunscreen from Walgreens over a sunburn. But if you have the option check out your local health food store for their natural sunscreens. California Baby has a great, water resistant sunscreen that works for kids and adults and smells really good. It uses micronized titanium dioxide, which is a physical sunscreen rather than chemical like oxybenzone. It reflects the suns rays like a million tiny mirrors. 2. 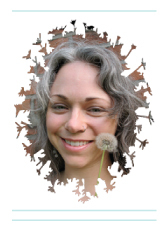 Did you know that citrus essential oils can be photo-toxic? That means that if you use a product with any significant concentration of orange, lemon, grapefruit or other citrus essential oil before heading out to sun exposure your skin can be discolored and can burn much worse than normally. Skip citrus body oils and don't dribble any of these in your bath water. Bergamot FCF is one of the only citrus oils that is safe to use. FCF means that the components of the essential oil that would otherwise be phototoxic have been removed. 3. Your face will be with you forever. Invest in a hat. It will help save you thousands in cosmetic surgery later on. 4. Your face also receives more exposure than any other body part besides your hands. Wear daily sunscreen. No ifs, ands, or buts. When I'm going to be out and about I use Lavera's facial sun protection. I have yet to find a product in the Lavera line that doesn't meet my requirements for purity and quality. The texture of their products is amazing, scent great, and they are all approved by the BDIH standard in Germany, the strictest standard for natural personal care products. 5. 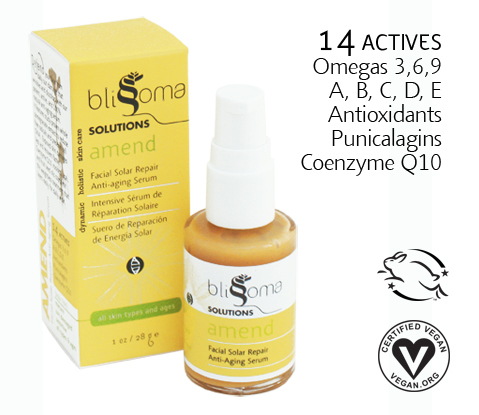 Since this article was first written Blissoma has added 2 incredible antioxidant products that can help fortify your skin naturally to better defend itself. Amend Antioxidant Soothing Lotion is incredible for your body and you can read up on it on another blog entry here. As of December 2012 to complement our Amend for the body we have now added an Amend specifically designed for your face packed with 3 times as much Pomella pomegranate extract, Coenzyme Q10, and more Acai and Cranberry seed oils. Amend Facial Solar Repair Anti-aging Serum is a daily use serum with long term benefits and your new BFF for damage prevention. Let's just say you'll thank us in 10 years when you're still looking firm, fresh, and with less buildup of those fine lines. So do yourself a favor and protect! Otherwise people will soon be able to see you were alive for the eighties. I know that's a secret you'd rather keep to yourself (along with all the photos of you with your mall bangs and Z. Cavaricci pants). Don't worry, I'll never tell.